When Holly Sheppard graduated from the University of Advancing Technology with a degree in multimedia and digital animation, she immediately started working as a 3D artist—in a lab. She used her skills in Unreal Engine to create simulations and models of restricted areas of the Los Alamos National Laboratory. University of Advancing Technology alumnus Raymond Blackwood makes software that runs colleges. He geeks out about solving higher education problems through technology to ensure that colleges and universities of all sizes have the tools and processes necessary to manage student lifecycles as efficiently as possible. He also travels 40 weeks out of the year, collects Star Wars comics and takes his boat out on the water as much as he can. Navigating Instagram in the 21st century with all of the rinstas, finstas, flop accounts, "models" and crazy comments can be tough. But Instagram can be an incredibly helpful tool when building your personal brand, growing your business or job hunting. Arizona businesses face evolving privacy laws, enforcement practices and cyber crimes. That’s why the Phoenix Business Journal invited some of Arizona’s leading cybersecurity and legal experts to discuss the cyber problems facing Arizona’s businesses and offer solutions at the Cybersecurity Forum earlier this week. The University of Advancing Technology has been teaching cybersecurity for more than 20 years, which is why the PBJ team invited UAT Provost Dr. Dave Bolman to moderate the panel discussion for the second year in a row. The University of Advancing Technology is honored to be one of 8 local businesses recognized by the Greater Phoenix Chamber for its contributions to the Greater Phoenix business community as a 2019 IMPACT Awards winner in the Economic Driver category. 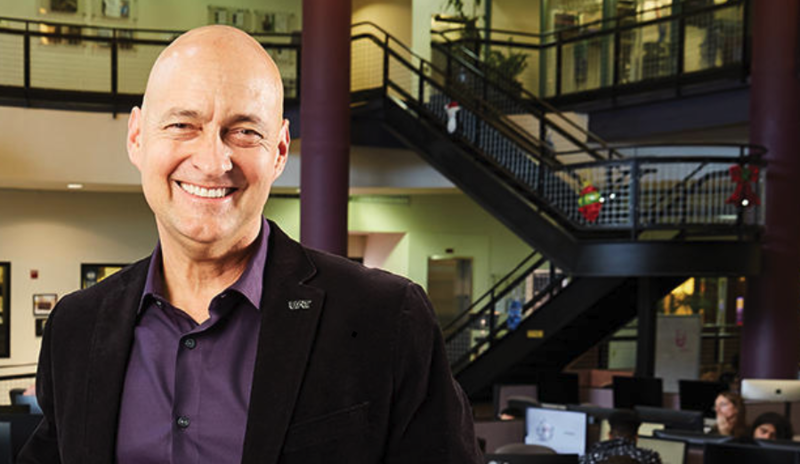 Provost and longtime professor at University of Advancing Technology (UAT), David Bolman, is moderating a Phoenix Business Journal forum that will be discussing the state of cybersecurity and the rise of the tech community in Arizona. Greck Santiago likes to build things—robots, circuit boards, microcontrollers. Naturally, when he came to the University of Advancing Technology to study robotics, he thought he would graduate and get a job as a robotics engineer. Then he discovered software engineering and embedded programming and realized that building cool things didn’t necessarily involve hardware and wires. On Saturday, February 15, UAT’s Cybersecurity team participated in the Western Regional Cyber Defense Competition. UAT’s team was made up of 8 students, all taking on different roles as team members. Right now, there are 7,000 unfilled cybersecurity jobs in Arizona alone. Nationally, we need an additional 400,000 security analysts, network engineers, vulnerability researchers, pen testers and other professionals to fight cybercrime and protect data. The Obama Administration estimated that the US would have 1.4 million computer science jobs by 2020—but only 400,000 computer science graduates to fill them. How do you make a Virtual Reality (VR) Movie? I’m sure you’ve tested out a VR headset, whether it be a game or a short film, and thought, “Wow, this is pretty cool! But how do they do it?" How do they make it so realistic, how do they place you inside the game or the film? What goes into making a VR movie? Earlier this week the Arizona House of Representatives invited University of Advancing Technology Provost Dr. Dave Bolman to the Capitol to present on technology trends and workforce needs in Arizona. I experienced tons of edgy, unique and, at times, borderline weird tech at CES 2019. 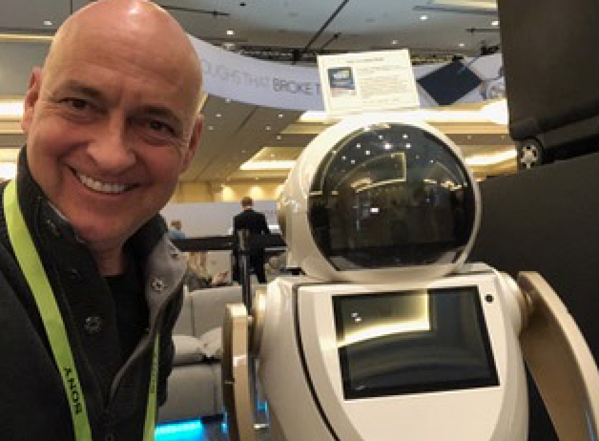 But most vendors at this year’s Consumer Electronics Show presented products that aim to seamlessly infuse connectivity and artificial intelligence into people’s homes and lifestyles. The volume of inventions that focus on using these technologies to improve human’s lives and experiences nearly doubled from 2018. Entire halls encompassing hundreds of thousands of square feet were dedicated to this pursuit. Eighty precent of jobs are not posted online. So how do you find those open jobs and the hiring managers? An over-looked way to network with industry professionals or like-minded individuals is to join a group. Hiring managers specifically look for people who proactively contribute to their community, present at events and mentor others. But the benefits of joining a group go beyond just networking. Groups give you the social life that many people may leave behind due to their commitments to work/family/school. Students in math classes across the world often ask, "When am I ever going to use this?" No one asks that question in Professor Heather Peters' Business Math class at the University of Advancing Technology, where students learn life skills that they can actually use. Embark on a quest to find your people. No longer feel lost in the crowd. At University of Advancing Technology, you will find fellow geeks who speak programming, cyber, gaming, esports, and cosplay. Join us on 1/25/2019 and EXPERIENCE UATx. See why we believe it is the right choice for for future students interested in technology. Potential students have the opportunity to meet the faculty, tour the campus, play in our technology labs, and stay overnight in our dorm. Garrett Reuscher gets a kick out of surprising dental hygienists when he refers to his teeth by their number. Garrett has picked up a lot of medical terminology since he started working as an educational applications developer at a Western University of Health Sciences university, where he develops games and simulations to train medical students. Most college applications require an essay, which can intimitate and discourage some, but that's good news for go-getters like you! Following a few best practices will help you write a college application essay like a boss (and maybe even earn a scholarship and save a lot of money). Even if you're not interested in marketing and advertising, the one newsletter (aka: boring email in your inbox you don't remember signing up for) worth checking out once a year is the Think With Google: Year-End Search Trends issue. Advancing Computer Science Professor Tony Hinton started coding when he was 12. But one boring computer class in college almost broke him. “It made me second guess whether I wanted to work with computers or not,” Tony lamented. Cybersecurity may seem like an intimidating and overwhelming concept for people who do not know much about technology and information security, but others live for the challenge of deciphering the unknown and protecting the vulnerable. And that challenge excites and motivates UAT alumna and risk and compliance manager Terra Cooke. This blog post was originally published on the ExpressVPN blog. Tempe, Arizona - October 29, 2018 - On November 5 and 6, 2018, University of Advancing Technology (UAT) hosted the VR for Good 2018 Summit, sponsored by VR Voice and Baltu Studios. Over recent years, many leaders of the tech revolution have celebrated the life of Alan Turing's. For his 100th birthday, Google made a Turing Machine Doodle. Wired has a retrospective on Turing's influence on computing, and a discussion of the validity of the Turing Test for machine intelligence. In my short time with UAT, I have been fortunate enough to interact with talented students, incredible professors and some top-notch industry professionals. The knowledge they have in STEM is awe-inspiring, but at the end of the day, to be successful in any industry, you must possess more than just technical skills. UAT Featured: SI News Asks, “How Relevant Is VR?" Study International News, an Independent news site focused on international students studying in the US, recently wrote an article about the relevancy of Virtual Reality in today’s society. UAT attended CactusCon 2017 in the Robotics Village on Saturday, October 1, at Phoenix Convention Center. The Arizona Science Center is blowing up the night for a special adult-only event featuring a twist on science demos and experiments, a high energy DJ, specialty drinks and a presentation on "Animation and Virtual Reality" by UAT Game Studios Professors Jorge Portillo and Ben Reichert, who just returned from a week at E3, the Electronics Entertainment Expo in California. John Goodall arrived at UAT like many freshmen, with a very specific career goal of becoming a 2D concept artist. Then he discovered 3D art. “I realized that was my home,” John said. “A lot of the pipelines for 3D art are the same or similar to real-time and pre-rendered projects,” he added. Meet Gerben Kleijn, Security Consultant and Penetration Tester at Bishop Fox. Google has announced their search results algorithm this week will start taking into consideration copyright renewal notices. According to Amit Singhal, Google's SVP of Engineering, “Sites with high numbers of removal notices may appear lower in our results." That means Google is once again cracking down on duplicate content across the web. UAT held the 2nd Annual Cyber Security Open House on Thursday, Oct. 12, in conjunction with the national cause, Cyber Security Awareness Month. University of Advancing Technology (UAT) now offers the option to earn a professional certificate in technology-centric disciplines. These certificate options derived from the reality that local business is starved of technology talent and as such find themselves having a difficult time scaling for growth. As a long time partner meeting the needs of business demands, UAT is seeking to impact sector growth head-on. These certificate options afford business owners and executives the ability to grow their company while offering employees seeking career advancement opportunities an affordable option to add professional development to their resume. We recently invited UAT alumnus and ArenaNet 3D Environment/Prop Artist William Tate to share his career story with our game development students. I hear all the time about how the young adults of today lack specific traits that have been deemed necessary for success in corporate culture by previous generations. I always find these comments humorous as every past generation finds a way to demean the younger generations for what they perceive as faults. As someone who has worked in traditional corporate culture, operated his own business and now teaches young adults in academia, I tend to favor the younger generations. UAT has led the way in cyber security since the late 90s, writing the rule books for cyber security education in Arizona. If you haven't tried Klout yet, it's addictive. Klout provides a score based on your social influence using the sites you interact with such as Facebook, Twitter, LinkedIn and Google+. The Klout Score ranges from 0-100, with 0 meaning you have no influence, or haven't provided Klout links to any of your social profiles. You've copy and pasted your entire resume, checked all of the boxes and entered in all of your information. You hit "next" only to be faced with the (sometimes mandatory) option of uploading a cover letter. Thousands of people apply for jobs in the ultra-competitive tech field. How do you stand out? jQuery and HTML5 are taking over the web. In the tech world, UX designers are known as unicorns. They possess that elusive combination of visual design chops and technical skills. None of them grew up wanting to be a UX designer. Their job descriptions are all over the place, and companies can’t decide what to do with them. (So, they end up doing a little bit of everything.) UAT alumnus Brady Vontran’s path to UX design has been pretty typical because it has been atypical. A team of UAT students spent the summer designing a self-funded stratospheric balloon program to gather scientific data, test and demonstrate new technology and inspire the next generation of space explorers. Not many people can say that their cyber security career began by breaking into their college’s computer system. But that's exactly what happened to Sean Moshir, co-founder, CEO and chairman of CellTrust and pioneer of the multi-billion-dollar patch management industry. After a two-week suspension, the college allowed Moshir to continue and graduate, on the condition that he tell them how hacked their system. On April 27, 2018, North Korea and South Korea signed the Panmunjom Declaration for Peace, Prosperity and Unification of the Korean Peninsula. Two electronic versions—one in English and one in Korean—have been stored on the Ethereum blockchain. The energy industry alone has invested $1 billion in blockchain. UAT Student Brett Butler’s experiences at Disney theme parks, resorts and cruises inspired him to join the maker movement. His dream job? “Working at Disney as an Imagineer!” The term Imagineer combines imagination and engineer. Brett definitely fits that description. Voice recognition is a prominent technology that is being used in more and more places today. There is voice recognition for recognizing the speaker. This type of voice recognition is used for security (physical access and access to files in computer network). In both your professional and personal life you will need to develop your emotional intelligence IQ which is usually referred to as your (EQ). Last weekend, the Global Game Jam (GGJ) took place around the world with UAT listed as the home base for Arizona. UAT students, alumni and local game developers attended the Phoenix Global Game Jam revving out 48-hours of game development and judges said they were impressed! Information is not difficult to find. Search engines utilize web databases, reviewers’ blogs and RSS feeds. Practicing research techniques that help you become adept at locating the information you need is easy. But how do you know if the information is accurate or relevant? Professor Natasha Vita-More gave a talk virtually to Microsoft Main Campus for the Extreme Futures Tech Festival. Great people and much fun! How does Blockchain Impact Privacy? Blockchain believers hail the distributed ledger technology as a transformative means to enhance trust and transparency. But how does it impact privacy? We may hit 3.5 million unfilled cyber security jobs by 2021. That’s a lot of SOC analysts, network engineers, systems administrators, IT auditors and penetration testers. Education, business, government and community partners all recognize the cyber skills gap, but it’s still tough to get a job—or at least the job that you want. UAT Robotics students took a road trip to participate in the VEX U Robotics Tournament last weekend at Embry Riddle Aeronautical University in Prescott, Arizona. While this is not a qualifier for VEX Worlds Championship, it does earn points for qualifying for Worlds. Game Studies Team Provides VR Support for USA TODAY's Project "The Wall"
Five UAT Game Studios students worked on a project called, “The Wall: Unknown Stories, Unintended Consequences,” under the leadership of USA TODAY NETWORK and The Arizona Republic. After 15 weeks of research and development, "The Wall," launched on Sept. 20. Written by game programming student William Mann. When I was a soldier in the U.S. Army, I was responsible for being able to pass the Army Physical Fitness Test (APFT) and for meeting the weight standards for my age, height, and gender. Alumni Jesse Rogers, who studied Game Design at UAT, had the chance to compete in the final stage of Oculus's The Unspoken VR Tournament for Oculus Rift Touch last month in New York City. Because Jesse made it to the Top 8, he won airfare and a hotel stay in New York City so he could participate in the finals. UAT is doing its part to encourage more females to explore a future in technology. Last week on June 7, UAT kicked off hosting a series of technology-themed workshops for residents of the newly opened Girl Scout camp, the Bob and Renee Parsons Leadership Center for Girls and Women at Camp South Mountain, which opened last April. The Campaign for Girls in Arizona is an effort by Girl Scouts–Arizona Cactus-Pine Council to achieve better outcomes for Arizona’s girls. Human Enhancement & Emerging Technology Professor Dr. Natasha Vita-More Featured in "Inhuman: The Next & Final Phase of Man is Here"
"Inhuman: The Next & Final Phase of Man is Here" is not fiction or a mockudrama but a new investigative documentary from Defender Films and Raiders News Productions. AZ TechCelerator and UAT have partnered in offering a chance at a full year of rent and support at the AZ TechCelerator office in Surprise, Arizona. Yesterday ICANN revealed applications from about 500 companies for new generic Top Level Domains (gTLDs) that could devalue the coveted .com extension and open up a barrage of legal issues. The close to 2,000 domains, also referred to as strings, look like .aaa, .hotels, or .ibm. If you notice, there's no need for an extension such as .com or .net because the gTLDs are essentially the same thing -- except anyone can purchase them. But before you plan on buying .yourname you might want to know how much the gTLDs cost. Google's search algorithm looks down upon duplicate content. So what do you do if you have multiple pages with duplicate content? Google's WebMaster blog clues you in to several different methods of addressing duplicate content. Check out the options below and choose which method suits you best.